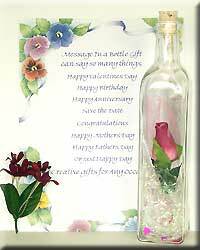 Stock# - 01086tgs Message in a Bottle Single Rose Bud - Beautiful Rose Bud, a unique Message in a Bottle greeting for any occasion of love and romance. 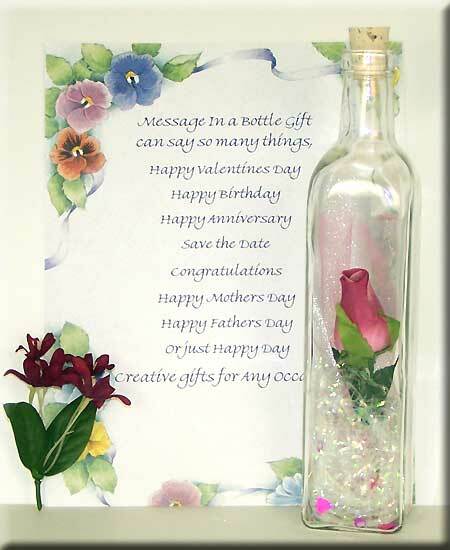 Description: Exclusive, Square Glass Bottle - 10.0 inches tall & 2.25 inches wide, choice of scroll with your personalized greeting imprinted and inserted inside of the bottle. 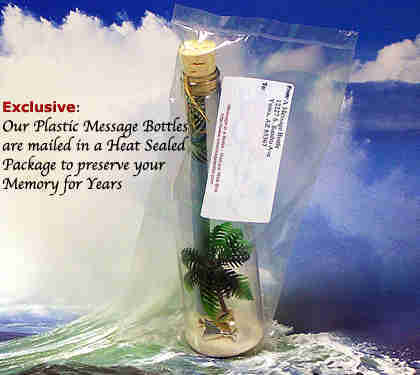 Message bottles are mailed in a white shipping tube USPS Priority Mail or USPS Priority Mail box if you select any additional accessory. 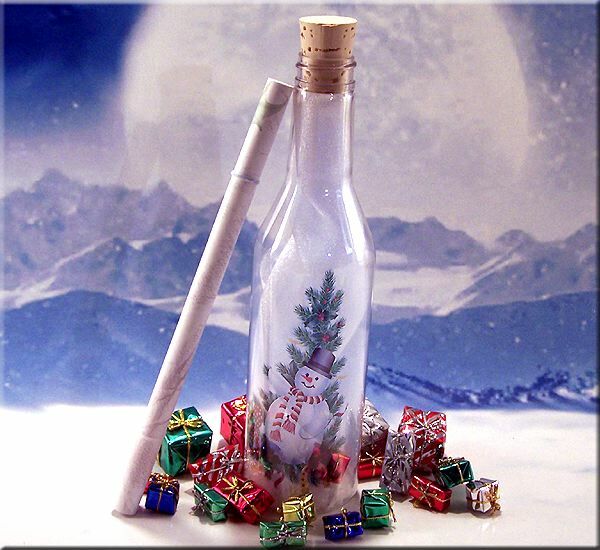 Stock# - p01313tgs Plastic Message in a Bottle Santa with Presents - Santa is coming to town with lots of presents for your loved ones. 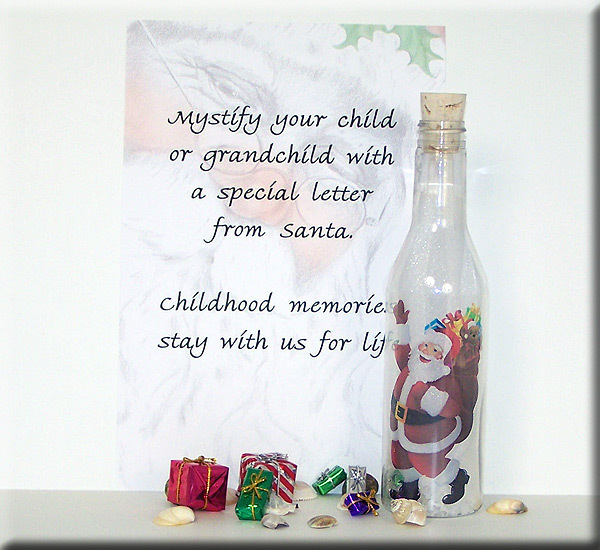 Send a Greeting and a Gift with your personalized greeting printed on the scroll. Select a scroll from the drop down menu and enter your greeting in the box below. Please select scrolls without borders for plastic bottles only. 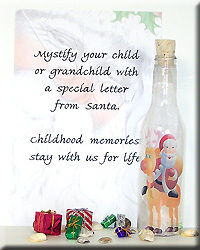 Stock# - p01314tgs Plastic Message in a Bottle Santa and Rudolf - Christmas is a magical time of year for our little ones. Santa and Rudolf are coming to town with lots of presents for your loved ones. 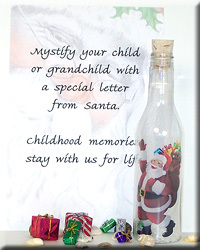 Send a Greeting from Santa and a Treasured Message Bottle Gift with your personalized greeting printed on the scroll. Select a scroll from the drop down menu and enter your greeting in the box below. Please select scrolls without borders for plastic bottles only. 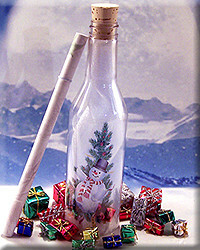 Stock# - p01317tgs Plastic Message in a Bottle Christmas Delight - The wonderful delight of Christmas is brought to your loved one by this adorable little snowman sitting by a Christmas tree loaded with Holiday cheer. 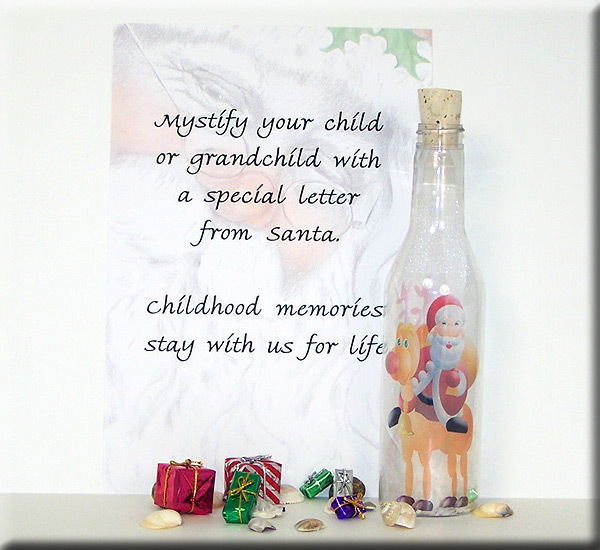 Send a Greeting and a Treasured Gift with your personalized greeting printed on the scroll. Select a scroll from the drop down menu and enter your greeting in the box below. Please select scrolls without borders for plastic bottles only.